Macmillan Co., New York, 1922. 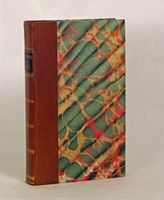 With a preface by Morris R. Cohen, who had supplied a copy of the original French edition to Holmes, causing him to describe it to Pollock as "the bread of life . . . I haven't for a long time read a book that embodies so many things that I believe"
John Murray, Albemarle Street, London, 1861-63. First and second editions of both of Austin's major works, of pervasive impact on Anglo-American law over the last two centuries and, in the words of H.L.A. Hart (who edited the 'Province' in 1954), "established the study of jurisprudence in England"
Printed for J. Martin, and J. Ridley [etc. ], London, 1650. 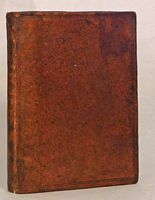 First edition of the principle part of Hobbes' first philosophical work, written in the early 1640's, "a complete philosophical tract, a sort of trial run for Hobbes's system . . . and the first draft of Hobbes's major work, Leviathan"
Carolina Academic Press, Durham, 1995. Printed by the Assignes of I. More Esq., London, 1631. 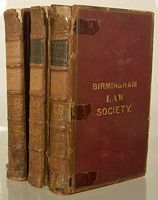 Only edition of Dodderidge's principal work, his singular attempt to determine the qualities of the lawyer and law student, and to probe the fundamental nature of law, his "scholarship reach[ing] far beyond that of most contemporary lawyers"
Little, Brown and Company, Boston, 1852. Original edition of Walker's probing effort to compare Roman law and common law, a principal part of his contribution to the civilian writers who "stand as an example of the highest intellectual attainments reached by antebellum American lawyers"
D. Appleton and Company, New York, 1864. Bossange Frerres, Libraires, rue de Seine, No 12, Paris, 1823. George Bunce & Co. No. 12, Wall-street, near the City-hall, New-York, 1794. Printed for G.G. and J. Robinson, London, 1791?. The rare, first English translation of Filangieri's treatise, an "implacable polemic against British constitutionalism" prompted in part by the American revolution and here translated "to fuel the struggle for . . . reform led by radical Londoners"
No Publisher, New Haven?, 1934?. Yale University Press, New Haven, 1939. Justice Cardozo's most famous work, his lectures delivered at Yale in 1921, in Judge Posner's words "the first systematic effort by a judge to explain how judges reason [and] the first serious effort by a judge to articulate a judicial philosophy"
Eliz. Nutt and R. Gosling for R. Gosling [etc. ], London, 1721. 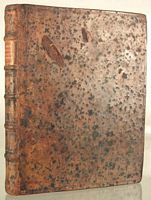 An early 18th century edition of the first classic of English equity, called by Professor Thorne "a most important book for the historian of English law" and recently described as "a brilliant . . . attempt to construct a systematic theory of law"
T.C. Hansard, Printer . . . Sold by Robert Heward [etc. ], London, 1829. J.B. Lippincott and Co., Philadelphia, 1874. Brown cloth, rubbed, top of spine chipped, rear hinge cracked; presentation copy from Lieber's widow--"With kind regards / of Mrs Francis Lieber"
Impensis Gul. Thurlbourn [for five others], London, 1748. One of Pufendorf's principal works, appearing in the Carnegie Endowment's Classics of International Law as "The Duty of Man and Citizen", exploring natural law and the notion of duty underpinning "the entire system of private and public law"
The rare separate printing of Dean Pound's essay, described editorially as a "piercing analytical examination of the threatening forces of the new political absolutism which endanger established ideas and customs of the American democratic order"
Yale University Press, New Haven, 1921. The copy of Justice Cardozo's most famous work bearing on the front pastedown the posthumous bookplate "made [by Judge Irving Lehman and as described in his Memorial to the Justice] for insertion in all the books in the library of Mr Justice Cardozo"
John Murray, Albemarle Street, London, 1832. First edition of Austin's first major work, of pervasive impact on Anglo-American law over much of the last two centuries, one which, in the words of H.L.A. Hart (who edited the 'Province' in 1954), "established the study of jurisprudence in England"
Columbia University Press, New York, 1928. First edition of one of Cardozo's three major works which, in their totality, Judge Posner has recently characterized as "the fullest statement of a jurisprudence of pragmatism that we possess"
Privately Printed, District of Columbia, 1990. The copy of Dr. Gaffney's doctoral thesis presented to the Director of his thesis committee, Antonio S. Cua, anticipating Dr Gaffney's 1996 monograph on Dworkin, "Ronald Dworkin on Law As Integrity: Rights As Principles of Adjudication"
The Ward Ritchie Press [for Claremont Colleges], Los Angeles, 1940. Typis E. Flesher, Prostat vero apud Nathanaelem Hooke [etc. ], London, 1672. First edition of Cumberland's "magisterial treatise on natural law", written in partial rebuttal of Hobbes, influential upon Pufendorf, and, in the view of some, qualifying Cumberland as "a forerunner, if not the founder, of English utilitarianism"
The Free Press, New York, 1976. Sumner Whitney and Company; Hurd and Houghton, San Francisco; New York, (n. d.). Printed by [Miles Flesher for] the Assignes of I. More Esq., London, 1631.